Roswell, Georgia’s climate is hot and humid in the summer and cold in the winter. With seasonal changes your the soil will expand and shrink, causing foundation problems for some homes in the Roswell area. If you notice that your doors are beginning to stick and the windows are harder to open, then you may have a foundation problem. Atlas Piers of Atlanta can repair your home in a timely manner with state of the art products and quality that counts. If you notice any of these signs it is a good time to call the foundation repair Roswell Georgia professional team at Atlas Piers of Atlanta. We offer so many solutions to all your foundation repair needs. 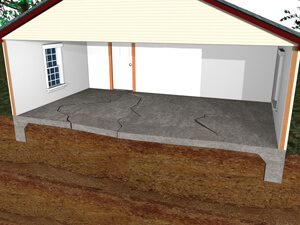 We offer underpinning solutions from Earth Contact Products. ECP makes the very best products for underpinning in the industry. These products are used to lift and add support for foundations. Helical piers lift garage columns, chimneys, porches, and stoops back to their original position while adding additional support so you don’t have to depend on the soil beneath your home alone. These piers work by driving deep into the ground to reach stable soil that is located under the top layers of constantly shifting soil. The weight of the structure can then be transferred onto the piers. This will give the foundation the support it needs and lift it back to its original position. The many types of piers that we use include: steel push piers, helical piers, porch piers, and slab piers. We also have steel push piers that can hold the full load of your home under your foundation. We offer a very special option for our Georgia service area. There is a way to support your bowing and leaning walls that is a “green” option for your family. We offer carbon fiber repair which uses carbon fiber strips to add strength and stability to your bowing and leaning walls. This is a great solution because carbon fiber is very strong, but it is also very earth friendly. Contact us for more information! Other foundation repair solutions that we offer include pressure grouting, and helical tiebacks. Pressure grouting is a method that is used to fill voids that may have developed under your foundation. In this simple process, a grout is injected under the foundation, filling voids to lift and stabilize the foundation. Helical tiebacks are often used to repair bowing or leaning walls. These devices are anchored into the ground next to the wall and attached to the wall. They apply horizontal pressure opposite to the direction of the lean to straighten the wall. We also offer crawl space encapsulation. This process actually takes the moisture out of your crawl space and completely encloses your crawlspace. We can use a vapor barrier that will allow you to store things in your basement. These products will actually make the air you breathe cleaner, and your utility bills go down. This is a foundation repair Roswell Georgia process that can really raise the value of your home, and make it a healthier place to live. Call us today for more information.